Contextual Electronics is opening for sign-ups this week! Finding big projects to work on can be tough as a small business. Chris suggests SBIR grants (though those aren’t always small). Dave doesn’t get lonely working by himself. Chris enjoys bouncing ideas off co-workers though, which is why he started a Meetup. Dave has resolved to attend or start on in the new year. China has landed a rover on the moon. This is different than the 70s movie about a Mars Mission hoax called Capricorn One. The SETI project still hasn’t found any intelligent life. Dave informed Chris that Paul Horowitz is one of the researchers on the project. Speaking of money, Dave launched his short Kickstarter for the uCurrent Gold! On the EEVBlog forum, there was a past smartwatch campaign where the project lead tried to convince Dave it wasn’t a scam project (it was). Dave has been pre-securing his supply chain so he doesn’t get stuff with orders but no parts. The cost of panels (at places like PCBcart) is relatively the same after tooling is paid for. The difference is the control over the panel look and function. Dave is getting a thermal oven/controller from PCBpool. Google is going crazy buying Robotics companies. We’re not sure why Google bought Boston Dynamics (the military contractor), but given the brain power there, it likely will enable other interesting projects. A recent bad episode that a ham radio kit business owner had to deal with shows why customer service can be a tough job. Six sigma is a system to help reduce and (effectively, but not actually) remove defects from production. Green belt training mostly taught Chris how to do real-world statistics. Why aren’t there fabs in Cleveland? What are the main inputs to building a fab? There’s a great map showing where many of the semiconductor fab facilities are. Chip of the Week: The Xilinx UltraSCALE made on the 20 nm node. Bring your piggy bank. This may or may not be the last show for the year. We’re going to try to sneak a show in around the holidays. 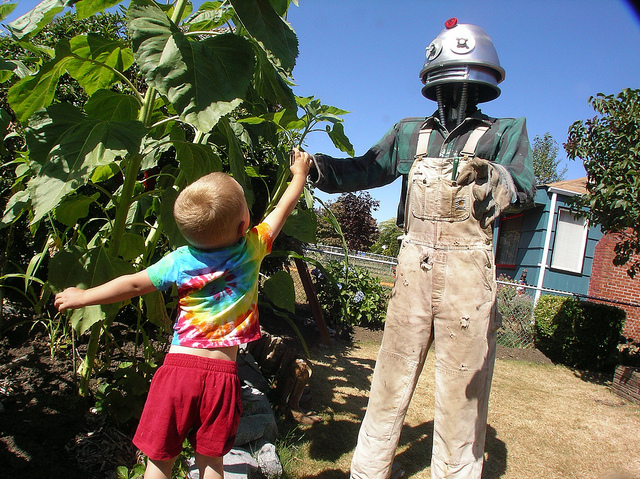 Thanks to tacomic tuesdays for the picture of the robot scarecrow. Fabs need a quiet environment to run. Its better to build a fab far away from busy highways, etc.